Radioactive material has leaked at the site of the former Dounreay nuclear power station in Caithness. 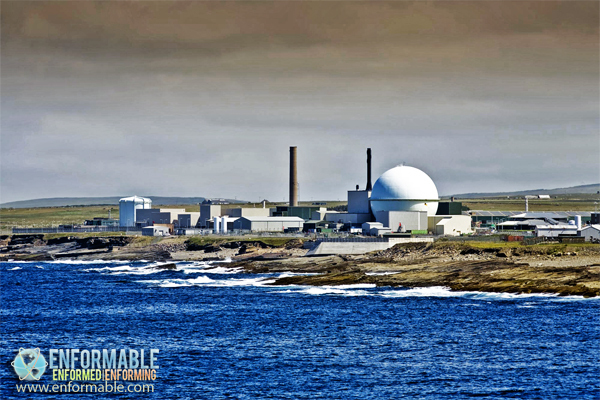 Dounreay is the the site of several nuclear research establishments located on the north coast of Caithness, in the Highlandarea of Scotland. Dounreay was originally the site of a castle (now a ruin). Radioactive liquid effluent is understood to have leaked inside a treatment facility. Radioactive liquid effluent occurs when a reactor and its equipment are cleaned. Sepa has launched an investigation. Dounreay is currently undergoing a £2.6bn decommissioning process. Dounreay was constructed in the 1950s as an experimental nuclear power complex, but has not generated electricity since 1994. Dounreay Nuclear Power Development Establishment was established in 1955 primarily to pursue the UK Government policy of developing fast breeder reactor (FBR) technology. Three nuclear reactors were built there by the UKAEA, two of them FBRs plus a thermal research reactor used to test materials for the program, and also fabrication and reprocessing facilities for the materials test rigs and for fuel for the FBRs. The treatment plant at Dounreay removes some radioactivity from the waste liquid as part of the process. A section of the treatment plant has been shut down for investigations. DSRL is in the process of dealing with 100 tonnes of breeder reactor material. The fuel is being stored securely while the dismantling of the site continues. Radioactive contamination that leaked for more than two decades from the Dounreay nuclear plant on the north coast of Scotland will never be completely cleaned up, a Scottish government agency has admitted. The Scottish Environment Protection Agency (Sepa) has decided to give up on its aim of returning the seabed near the plant to a “pristine condition”. To do so, it said, could cause “more harm than good”. At a board meeting in Stirling on Tuesday, the Scottish government’s environmental watchdog opted to encourage remediation “as far as is practically achievable” but to abandon any hope of removing all the radioactive pollution from the seabed. Tens of thousands of radioactive fuel fragments escaped from the Dounreay plant between 1963 and 1984, polluting local beaches, the coastline and the seabed. Fishing has been banned within a two-kilometre radius of the plant since 1997. The most radioactive of the particles are regarded by experts as potentially lethal if ingested. Similar in size to grains of sand, they contain caesium-137, which has a half-life of 30 years, but they can also incorporate traces of plutonium-239, which has a half-life of over 24,000 years – meaning that is the time period for half of the material to break down. The particles are milled shards from the reprocessing of irradiated uranium and plutonium fuel from two long-defunct reactors. They are thought to have drained into the sea with discharges from cooling ponds. 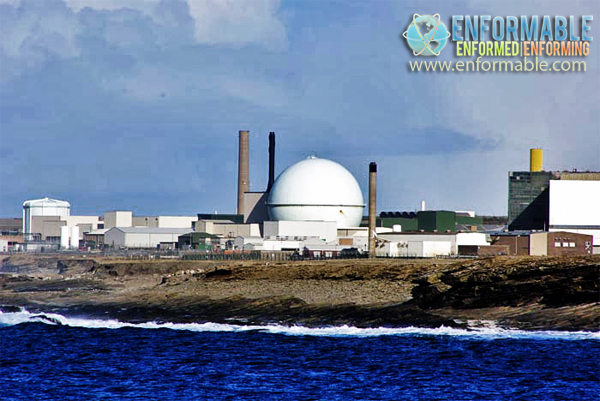 In 2007, Dounreay, which is now being decommissioned, pleaded guilty at Wick sheriff court to a “failure to prevent fragments of irradiated nuclear fuel being discharged into the environment”. The plant’s operator at the time, the UK Atomic Energy Authority, was fined £140,000. Since 2008, over 2,300 radioactive particles have been recovered from the seabed, with 351 removed by a remotely operated underwater vehicle this summer. Since 1983, over 480 particles have also been found on three local beaches and the Dounreay foreshore. Before dismantling begins, the sodium will have been drained out and treated in a sodium disposal plant, before a water-vapor nitrogen process is used to dissolve away the majority of the residue. A containment cell will be built over the top of the reactor and the RDM will be deployed on a set of rails and dropped down into the port. Its manipulator arms will reach 16 meter to access the outer regions of the reactor. The first task will be to lift out the shield rods in the center, using a large shear to cut the 30 centimeter-thick solid-carbon rods into smaller sections. Once the RDM has lifted the rods out, it will have access to the pipework, using one of its manipulators to grab the pipes and the other to wield a cutting tool. Baker writes that a series of candidate cutting tools will be developed and tested at an off-site facility to select the one most suitable for the job. Potential tools include propane mixed with iron powder, as used in the WAGR (Windscale Advanced Gas Reactor) at Sellafield, and plasma cutting for steel parts. The engineers are also considering using diamond-wire encrusted disks and standard hydraulic shears and developing a diamond-wire cassette system. Water jetting could also potentially be used, but only when the operators are certain all the sodium has been removed, because of its intense reaction with water. Operators will control all the motion on the system from the carriage to the hydraulically operated booms that extend in and out from a central control room. The RDM has dual redundancy built in, so if one system fails it has a back-up that can be retrieved in the event of an emergency. All the equipment that the RDM uses, plus its entire horizontal boom, can be lifted out like a cartridge-assembly system. If maintenance is necessary, repair work can be made on a part outside the cell once it has been decontaminated. Specialist materials will be used to withstand the high levels of radiation, including specially selected types of rubber, steel and hydraulic fluids. All the electronics will be radiation resistant, including the cameras used to guide the RDM, which cost in the region of £40,000 per unit. A 65-metre deep shaft used for intermediate level nuclear waste disposal is contaminating some groundwater, and is threatened by coastal erosion in about 300 years time. The shaft was never designed as a waste depository, but was used as such on a very ad-hoc and poorly monitored basis, without reliable waste disposal records being kept. In origin it is a relic of a process by which a waste-discharge pipe was constructed. The pipe was designed to discharge waste into the sea. Historic use of the shaft as a waste depository has resulted in one hydrogen gas explosion caused bysodium and potassium wastes reacting with water. At one time it was normal for workers to fire rifles into the shaft to sink polythene bags floating on water. Irradiated nuclear fuel particles on the seabed near the plant, estimated about several hundreds of thousands in number. The beach has been closed since 1983 due to this danger, caused by old fuel rod fragments being pumped into the sea. In 2008, a clean-up project using Geiger counter-fitted robot submarines will search out and retrieve each particle individually, a process that will take years. The particles still wash ashore, including as at 2009 -137 less radioactive particles on the publicly accessible but privately owned close-by Sandside Bay beach and one at a popular tourist beach at Dunnet. 18,000 cubic metres of radiologically contaminated land, and 28,000 cubic metres of chemically contaminated land. 1,350 cubic metres of high and medium active liquors and 2,550 cubic metres of unconditioned intermediate level nuclear waste in store. 1,500 tonnes of sodium, 900 tonnes of this radioactively contaminated from the Prototype Fast Reactor. Historically much of Dounreay’s nuclear waste management was poor. On 18 September 2006, Norman Harrison, acting chief operating officer, predicted that more problems will be encountered from old practices at the site as the decommissioning effort continues. Some parts of the plant are being entered for the first time in 50 years. In 2007 UKAEA pleaded guilty to four charges under the Radioactive Substances Act 1960 relating to activities between 1963 and 1984, one of disposing of radioactive waste at a landfill site at the plant between 1963 and 1975, and three of allowing nuclear fuel particles to be released into the sea, resulting in a fine of £140,000. Due to high quantity of uranium and plutonium held at the site, it is considered a security risk and there is a high police presence. March 11th, 2011 – I’m sure you have heard about the 8.9 earthquake off the coast of Japan – We should be prepared to brief on our tsunami research. Maybe also seismic.